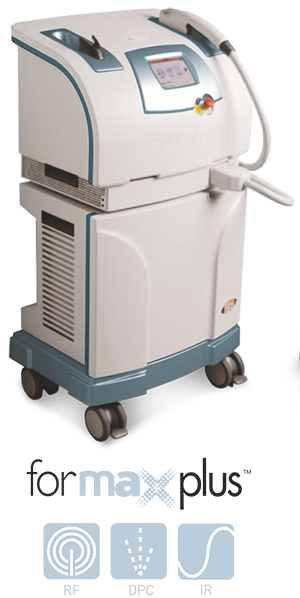 SharpLight’s FormaxPlus is the single platform combining advanced Dynamic Pulse Control (DPC), Radio Frequency (RF) and Infrared (IR) for facial and hair removal medaesthetic treatments. DPC is a proprietary pulse-based IPL that lets you select the ideal treatment parameters from three different pulse configurations. Thermo-electric cooling, precise optical filtering and unique energy pulsing ensure optimal results with safe, comfortable and effective procedures. Interchangeable handpieces with different filtering systems support a range of applications, including skin treatment, vascular and pigmented lesions, acne and hair removal. Three different pulse-configurations deliver maximum results for all skin types and shorten the number of treatments by 30%. Contact cooling maintains epidermal temperature at close to 50 C even during continuous treatment of extensive areas. This unique method guarantees maximum skin safety, patient comfort and no need for anesthetic gel. The practitioner has full control over the contact cooling option, and can determine, straight off the screen, whether it should be used or not. Formax Plus™ bi-polar and multi-polar RF Handpieces offer a safe, virtually pain-free and non-invasive treatment for body contouring, cellulite reduction, skin rejuvenation and skin tightening, using 2 designated handpieces for face & body. Formax Plus RF handpieces offer a safe, virtually pain-free and non-invasive facial and body treatments using designated handpieces. Intermediate and long term results are achieved safely, efficiently and painlessly due to the unique technology that used concentrated RF power of up to 50 watts. A proprietary indicator allows practitioners to receive online feedback of pressure effectiveness by comparing the desired energy to the actual applied pressure level. Formax Plus IR introduces a versatile procedure with either a 3.4 cm2 or 6.4 cm2 spot size for facial treatments. Formax Plus IR is perfect for use on the face and neck. IR has one dedicated handpiece, for the face, making treatments extremely effective, convenient and precise. Based on thermoelectrically cooled sapphire window, the contact skin cooling mechanism emits pulses only when applied, ensuring epidermal safety and enhanced patient comfort during the treatment. The cooling transpires before, during and after each light pulse. A broad spectrum of Infrared light for medium and superficial skin layers fits all skin types.